Earlier posts had dealt with the many places that Rayaru had lived and visited and some of these include Bhuvanagiri, where he was believed to have been born, Thanjavur where he was given Deeksha by Sudheendra Theertha, Srimushnam where he stayed for years, Bichale where he spent thirteen years with his close friend Appanacharya and Mantralaya where he entered Brindavana in August 1671. Apart from these places, there are many other towns and cities that are closely associated with Raghavendra Swamy or Rayaru and his life and times. One such place is Srirangam, which is on the banks of the Cauvery and it is located in Tamil Nadu. Srirangam is one of the holiest places for Vaishnavas and Srivaishnavas as the stupendous Ranganantha temple is located there. Apart from the Ranganatha temple, Srirangam has a special place for Madhwas as many of the seers such as Madhwacharya, Sripadaraja, Vyasa Raja, Raghavendra Swamy, Vadiraja, Raghuttoma Theertha, Sudheendra Theertha, Vijendra Theertha and others visited the pilgrim town and spent time there. It was at the Ranganatha shrine that Sripada Raja got the idea of writing Devara names in Kannada and conducting poojas in Kannada apart from giving discourses in Kannada. Raghavendra Swamy stayed here and gave discourses on Upanishads apart from composing a few works. Raghuttoma Theertha first placed his work before Anjaneya here before releasing it as Bhava Bodhas. 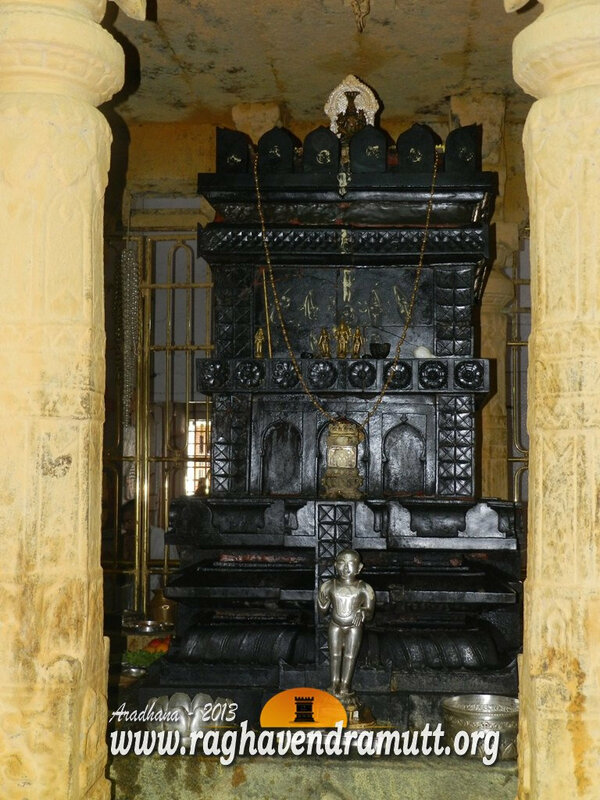 One of the oldest Raghavendra Swamy temple here is managed by the Nanjangud Raghavendra Swamy Matha or Mantralaya Matha. This matha has a hoary history and it as holy as any other matha in India. The matha has a brindavana of Raghavendra Swamy. But what makes this Brindavana special is that it stands right next to the Brindavana of Yogendra Theertha, who was the successor to the Mantralaya Matha after Raghavendra Swamy himself in 1671. It was Yogendra Theertha himself who led Raghavendra Swamy with all honors and held his hand and took him up the steps of the platform where the Brindavana for Rayaru was constructed. Yogendra Theertha is thus one of the few peers who saw Raghavendra Swamy entering Brindavana. Yogendra Theertha was twice blessed when Rayaru, during his last speech to his devotes who had gathered about the Brindavana, asked then to cooperate with his successor in running the matha. Raghavendra Swamy also earlier in the day gave his last Upadesha to Yogendra Theertha. Yogendra was an excellent scholar. It was to him that Diwan Venkanna, also known as Venkanna Pant, had re-conveyed the village of Manchale or Mantralaya. Soon after Raghavendra Swamy entered Brindavana, Yogendra Theertha stayed back at Manchale and made arrangements for the pooja of Brindavan. He then went on a tour of south India and he defeated many pandits from other philosophical streams such as Kala Shastry in Bhagyanagar. He then came to Kumbakonam where he had a darshan of Vijayendra Theertha sitting in his Brindavana. He then proceeded to Srirangam which then was under the Nayakas of Madurai. Tirumala Nayaka’s grandson, Muddalagadri Nayaka, was the ruler of the region and he gifted the village of Arambhanna on the river Tamraparni and Kalla Mutt lying to the west of Chitra Street in Srirangam on Akshaya Thritheeya in 1679 to Yogendra Theertha. Yogendra Theertha then decided to settle down at Srirangam itself and he entered Brindavana on the tenth day of Magha Shuddha in Vibhava Samvatsara. He choose this very spot as he heard the voice of Raghavendra Swamy telling him to settle here. This day is holy as it comes the day after Madhwanavami. Yogendra Theertha headed the Sri Matha from 1671 to 1688. He was fortunate as Raghavendra Swamy was both his Vidya Guru and Ashrama Guru.